His base for this difficult work is the Ebola treatment centre in Foya, a small Liberian town with no running water or electricity. It’s shared borders with Sierra Leone and Guinea puts the town at the nexus of the crisis – it’s in these three countries that the bulk of the over 10,000 reported cases of Ebola have occurred, and where almost all related fatalities have been recorded. Robert crossed the river into Foya on a rickety old canoe after almost a week on a plane, but there was no time for jetlag, the 32 year-old quickly enveloped in the maelstrom of operational set-up activity as a stream of patients continued to arrive. 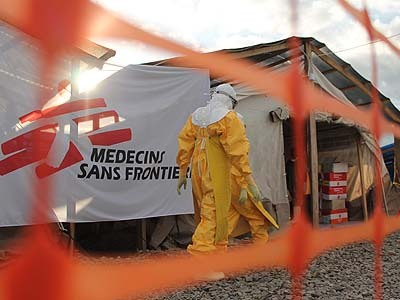 As a logistician for Médecins Sans Frontières (MSF), his focus has been on improving facilities for the centre and for the associated outreach activities: erecting new buildings, hiring vehicles, installing radios and generators, rewiring electricity lines and building toilets and waste disposal centres. It’s a big job under challenging conditions, supporting a treatment centre the size of a couple of football fields and with the potential to house up to 100 patients. He also resources a large outreach team as they head into surrounding communities in convoys of four-wheel drives, responding to alerts for new patients and to collect the bodies of those for whom diagnosis and care would come too late. “It’s a difficult place to describe,” says Robert of the treatment centre, and the intensive safety processes that quickly become normalised for those who work there. The facility is divided into zones, the low-risk zone home to the subsidiary and preparatory activities – laundry, change rooms, pharmacy, kitchen, water supply tanks, logistics, construction stores, and laboratory facilities for rapid diagnosis. Beyond this lies the high risk zone that is home to suspected and confirmed patients, along with the morgue and waste disposal zones. It’s here that the highest level safety precautions are in place. “Getting things into and out of the high risk zone is a complicated procedure that is beyond my current abilities of description,” he adds. While the situation in Foya has stabilised as construction and resourcing needs ease and patient numbers steadily decrease, other centres across the region are still struggling to meet the level of response required. Robert’s hard work is far from done. 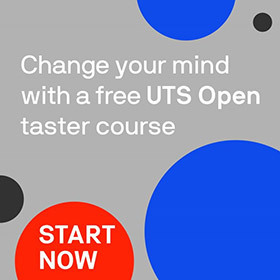 Robert graduated from UTS with a Bachelor of Business Bachelor of Arts International Studies in 2007, and worked as a policy advisor and researcher for various organisations including the Australian Government, the United Nations Development Programme and international research consultancy STATT before taking up his role with MSF.